Parents are important members of the Horace Mann School community, and HM communicates and shares information in a variety of ways so that parents can participate in their child’s educational development and have a clear understanding of the School’s mission, core values, programs, and policies. Events like Orientation Days and New Parent Nights help families to get to know the School better as their children join us. Parent Visiting Days and Meet the Faculty or Curriculum Nights give parents additional opportunities to learn about the School and the specifics of what their child is learning and experiencing daily. Homeroom teachers in the Nursery and Lower Divisions and advisors in the Middle and Upper Divisions meet with parents to discuss their child’s progress and school experience during scheduled conferences. The Divisions host coffee hours and roundtable discussions for parents to discuss topics of importance of interest relating to child development. We host orientation meetings prior to the important trips, transitions, and programs, including the John Dorr Nature Laboratory overnight trips. Coffee with Coaches meetings allow parents to ask sports-related questions, and a Letting Go evening provides parents and seniors an opportunity to talk about issues associated with leaving home and going to college. Parent education also includes parent workshops highlighting the developmental milestones of children in each division. Workshops and parent seminars at the Nursery and Lower Divisions include topics on sibling rivalry, setting limits, nutrition, and friendships, while topics at the Middle and Upper Divisions include adolescent development, health education, teen issues, and anti-smoking, alcohol and drug education. Outside of formally scheduled activities, parents have many opportunities to volunteer at School, helping with activities like Nursery Division library, Lower Division field trips, the Middle Division International Food Festival, and Upper Division Book Fair. Parents are also very involved with School extracurricular programs, including athletics and performing arts. 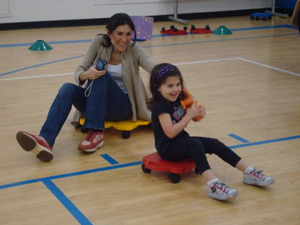 The Parents Association provides many other parent volunteer opportunities, and parents also participate as volunteers with the Admissions and Alumni & Development Office. In addition to the 'in-person' events and activities, Horace Mann School provides a variety of other ways for parents to stay informed and involved, including this website, the Family Handbook, and monthly Across the Divisions e-newsletter with current events and news in each division.